I love it when we discover a hidden, family travel gem near our own backyard! Of course, once we really take the time to explore some of these unexpected finds--we wonder what took us so long to visit them! We have driven by the Spring Valley Nature Preserve sign near Granville, Ohio, hundreds (probably thousands) of times over the past 10 years--planning to visit when we had a little time. We actually stopped once, several years ago, in the early spring and had a quick lunch picnic in one of the shelters--but, didn't really take the time to explore. 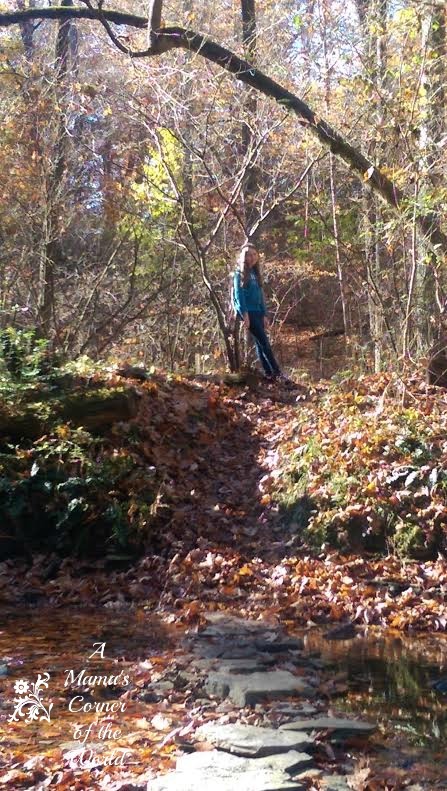 This weekend, my husband and youngest daughter set aside a couple of hours to check out the Spring Valley Nature Preserve--and it offered so much more than either of them expected. What should you know about the Spring Valley Nature Preserve in Granville, Ohio? 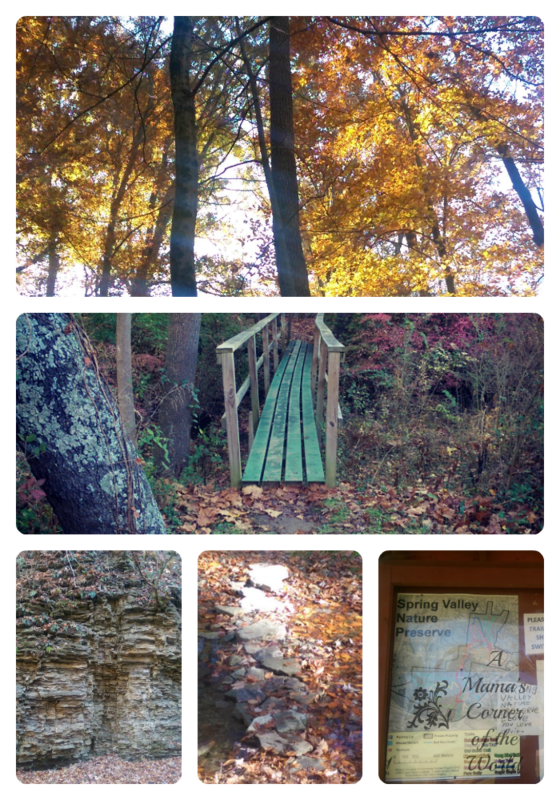 Spring Valley Nature Preserve is a convenient day trip for family hikers in Central Ohio. Granville is located about 35 minutes from Columbus with the Spring Valley Nature Preserve located right on the edge of Granville on S.R. 16. There is a small sign--and a small entrance driveway--and you will drive right by it if you blink! My hikers spent about an hour and a half exploring the site--and walking a couple of miles on only a few of the trails. They ran out of time (and energy--as a couple of the trails served up more difficult hikes than expected)--but, they are already planning a return visit in a couple of weeks to explore the trails they missed. A natural rock "bridge" crosses a little stream along the Valley Trail. The Spring Valley Nature Preserve is best experienced on the trails. The parking area, the shelters, and the open space are really not much to look at--and it's easy to look around and think that there isn't much available at the preserve. That couldn't be further from the truth! The trails take hikers up to the top of a ridgeline with rock cliffs--and beautiful fall colors and scenery this time of year. I love fall colors in Ohio! This video shows only some of the photos captured from the Spring Valley Nature Preserve along the Flowerpot Trail, the Songbird Trail, the Valley Trail and some of the Roberts Ridge Trail. Some things to keep in mind if you visit the Spring Valley Nature Preserve in Granville, Ohio. Dogs are allowed on the trails. This surprised me a little as generally dogs are discouraged in Nature Preserves--but, it's okay to bring them as long as they are leashed and you both remain on the marked trails. You will need to keep an eye on little hikers. Some portions of the trails edge along high ridgelines--without guards or railings separating hikers from the edges. I wouldn't recommend it for young children without very watchful eyes on them. Fallen leaves make the trails a little slippery and a little more difficult to climb as well--so younger children may have a little more difficulty on portions of the trail as well. Some of trails edge very close to private homes. 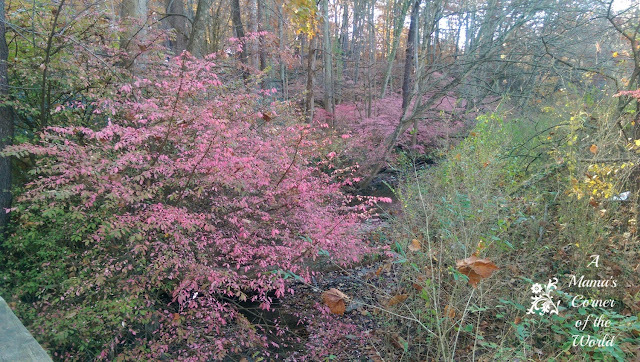 While, i am sure that it is peaceful at times to have property bordering on nature preserves--visitors to the preserve may be surprised to be so close to someone's backyard! Stay on marked trails and be respectful of the adjoining properties. Plan a picnic. There is a lot of space for picnics in the open areas or shelter houses near the parking lot. We almost always pack a picnic for hikes. 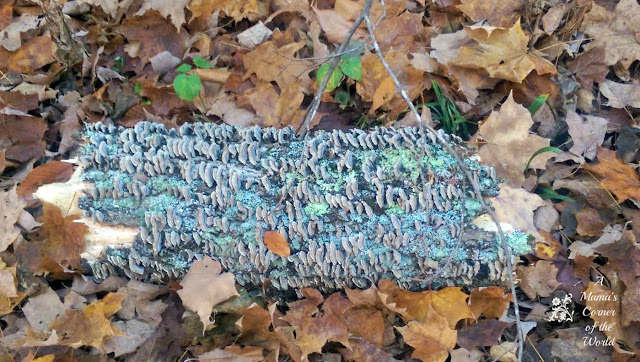 This log was inches from the trail--covered with a brightly colored fungus. Granville and Newark offer a lot of different lodging and dining options should you opt to turn it into a weekend trip. 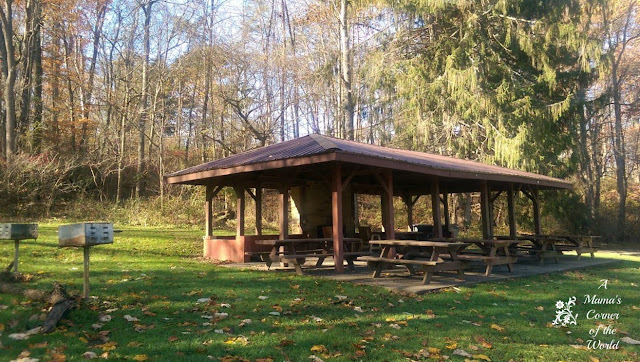 This park is located just a couple of minutes from "downtown" Granville and Denison University. That area is home to some coffee shops, family friendly restaurants, and shops. Another 5 or 10 minutes away, is the city of Newark. It may seem that you are in the middle of nowhere when you visit the nature preserve--but, you are not far at all from lunch or dinner if you opt to skip the picnic!